Wyoming Seminary was founded by Methodist Church leaders in 1844 at the instigation of George Peck. At the time, it was common practice to call any academy or school a "seminary." While the school remains affiliated with the United Methodist Church, it welcomes students from all religious backgrounds. The first class of Wyoming Seminary contained 31 students — 17 boys and 14 girls from Pennsylvania and New York. The school's first president was Rueben Nelson. At the time, Kingston was a rural village, and the school raised livestock, grew its own produce, and built a smoke house to preserve meat for the winter. After the industrial age began, the school grew. In the wake of the region's new mining and manufacturing concerns, a dedicated business school was created and a college preparatory program was established. As extensively documented by historian Leroy Bugbee in his account of Wyoming Seminary's first 100 years of existence, much of Sem's rise as a prominent college prep school took place during the tenure of Levi Sprague. Sprague was a Sem alumnus who served as the school's president for five decades from the 1880s to the 1930s and was associated with the school for nearly his entire life, ultimately dying while in office. The street that most of the Upper School campus is located on is named Sprague Avenue, the central building that hosts most classes and administrative offices there is called Sprague Hall, a bust of Sprague is featured in this building, and since 1993, a yearly prestigious scholarship for seniors that offers free boarding for eight selected student leaders is called the Levi Sprague Fellowship. In 1892, the Wyoming Seminary football team participated in the world's first nighttime football game, playing against Mansfield University (then Mansfield State Normal School). The game ended at halftime due to insufficient lighting, with neither team scoring. The school grew in the early 20th century. During World War I, parts of the campus were used for training of American soldiers from 1917 to 1919. By the early 1950s, Sem expanded to include what is today considered the "lower school", composed of nursery through eighth grade students. In 1951, Sem merged with the Wilkes-Barre Day School to become the region's only independent school to offer a complete program ranging from nursery through secondary school. By the late 1990s, Sem's Lower School, located three miles from Kingston in nearby Forty Fort, expanded its program by adding a prekindergarten-3 program and renaming its nursery school grade as prekindergarten-4. In the 1960s, the business and music schools were dissolved, leaving the college preparatory program as the secondary school's focus by the time Dr. Wallace F. Stettler became the school's ninth president in 1967. As the 1970s approached, Stettler oversaw dramatic changes that would forever leave a lasting impression on Wyoming Seminary. In June 1972, flooding from Hurricane Agnes caused serious damage to parts of Sem's Upper School campus. Under Stettler's leadership, Sem accepted significant federal aid from the Nixon administration, hand-delivered in the form of a check from Sem graduate and Nixon Wilkes-Barre area flood response director Frank Carlucci, to help revive its campus. This aid – combined with private money and the sheer willpower and vision of Stettler and his colleagues – helped lead to the construction of the Bell Tower, the Buckingham Performing Arts Center, the Pettebone-Dickson Student Center, renovations in Sprague Hall, and the construction of the Learning Resources Center, which includes a library, several classrooms, admissions offices, and a large conference room. This center is today named the Stettler Learning Resources Center in honor of Dr. Stettler. All of these efforts at the Upper School were completed in a short four-year period between 1974 and 1978. In little time, the school's endowment grew significantly, tripling by the early 1990s. At the same time, the school's vibrancy and community spirit was enhanced just years after the flood by the enormous success of the football team under legendary coach Marvin Antinnes. During the late 1970s and early 1980s, Antinnes oversaw over thirty consecutive wins for the team over a period of several seasons. At the time of Stettler's passing in October 2010, he was widely remembered for this work, as Times Leader recalled in his obituary that "Stettler not only rebuilt what had been damaged in the flood, he expanded the campus." In the same article, Sem's vice president of advancement, John H. Shafer, recounted that Stettler "made it possible for Wyoming Seminary to emerge from the flood an even stronger institution." Stettler's retirement in 1990 did not mark the end of Sem's growth. During the tenure of Sem's tenth president, Dr. H. Jeremy Packard, the school continued to expand in all fields including academics, arts, the extracurricular program, athletics, and in technology as the age of the Internet dawned. These expansions also included further renovations on its Upper School campus such as the 2006 construction of Klassner Field, named for athletics director Karen Klassner, for field hockey and lacrosse games. Sem also bought a former bank adjacent to its Upper School campus to become the Wyoming Seminary Great Hall, used today by the wrestling team as its practice facility. With regards to buildings already on Upper School campus, Sem's Sprague Hall, which includes all administrative offices and three floors of classrooms in all subjects except science, expanded to include a renovated, modernized new wing in 1999. At the Lower School, similar changes were made, including the construction of a new wing for fourth and fifth grade students and a new glass foyer. In the field of athletics, junior Kristina Benson became in 1993 the first student to join what had previously been an exclusively male varsity ice hockey team. By 2001, Wyoming Seminary's Upper School Men's tennis team won the team state title becoming the first to do so in all of Wyoming Seminary's history. The team was led by Math teacher O. Charles Lull. That same year, the SEM Upper School field hockey team won the state championship title. Since then, the field hockey team, under the leadership of athletic director and longtime field hockey coach Karen Klassner, has won four other state championships as well, in 2006, 2008, 2010, and 2011. The victory in November 2010 was a lopsided, historically large 5-0 victory. The growth of the school's athletic program also included significant success for the Upper School wrestling team. Since 2007, the team has won five consecutive state prep championship titles, has ranked extremely high among all private high schools in the nation since the early 2000s, and placed second at the 2009 National Preps Wrestling Tournament. In the extracurricular program, Sem's Model United Nations and Mock Trial groups grew in size and in their earning of championship titles in the region and the country. In the field of technology, Sem embraced Mac computers, putting Macintosh computers in classrooms and 'computer rooms' in both the Lower School and Upper School and using these devices frequently in classroom settings. The makeup of Sem's Upper School administration also underwent an overhaul. For one, Karen Klassner became the first woman to hold several high-ranking positions, including Dean of Students for some time in the 1990s. However, by 2003, the position of Dean of Students was erased and the duties of this office were now part of the responsibilities of the Dean of the Upper School. Prior to 2003, there existed both a Dean of Students and a Dean of Upper School. At the same time, the school also introduced the position of Dean of Faculty and a new Class Deans system in which there is a dean that presides over each class and typically remains with a given class for the entirety of its four-year run. Amid the dawn of this new administrative system at the Upper School, the Lower School also saw changes. In 2004, the school's longtime history of having a "Dean of Lower School" changed into a new two-dean system that includes a "Dean of Primary", a "Dean of Middle School" and 'coordinators,' essentially assistant deans, for the primary and middle-school grades. By the time of Packard's retirement in June 2007, the school had grown significantly, building on the achievements of the Stettler era. The school's next president, Dr. Kip P. Nygren, who took office shortly after Packard's departure, presided over continued changes. These changes included a new third floor of Sprague Hall, a vast renovation of the Lower School's first floor, and extensive restoration work on the Upper School dormitories. The most significant achievement on Nygren's watch was the construction of the Kirby Center for Creative Arts, which opened in the fall of 2014 shortly after the closing of Sprague Avenue to vehicular traffic. In spite of the continued changes taking place at Sem, and continued academic, athletic, and extracurricular achievements, Nygren and the administration were forced to temporarily suspend the football program in 2011 and 2012. Nygren cited lack of student interest, significant rates of graduation of football players in 2010 and 2011, and other factors. At that time, Dean of Upper School Jay Harvey underscored in a statement that he and others were "developing a plan to engage administrators, trustees, alumni and parents to review the dynamics of the program and the student-athletes and facilities necessary to ensure its success." That plan resulted in a completely renovated Nesbitt Memorial Stadium and the revival of the football program, which resumed varsity play in 2014 after completing a successful junior varsity season in 2013. In addition, successes such as the field hockey team winning three state championships in four years (2010, 2011 and 2013) and the Mock Trial team becoming state champions for the first time in March 2011 and earning sixth place in that year's national competition have also marked Nygren's tenure. Nygren announced in February 2014 his intention to retire from the school after the 2014–2015 academic year. In late 2014, it was announced that Kevin Rea, headmaster of the Hackley School in New York, would succeed Nygren as Sem's 12th president. On July 1, 2015, Kevin Rea became the 12th president of Wyoming Seminary. Wyoming Seminary's president, the 12th of the school, is Kevin Rea, who assumed his duties on July 1st, 2015. The current Chair of the Board of Trustees is William E. Sordoni, appointed to the position in July 2018. The Dean of the Upper School is Thomas Morris, who assumed his duties in July 2018. Anna The school has named a number of members to its board of trustees. 80% of Upper School graduates are accepted to colleges in the "competitive" to "most competitive" range. 98% of those who graduate from Sem successfully graduate college. 51% of students' families earn financial aid. 44% of teachers at the Lower School hold master's degrees compared to 51% at the Upper School. 13% of Upper School teachers hold doctorates while two percent of Lower School teachers also hold doctorates. The average size for an Upper School course is 14 students. At WSUS, there are 39 classes offered in math and science and 76 classes offered in the humanities. The Upper School offers, in total, over 160 courses, including 25 Advanced Placement classes, more than most public or private schools in the United States. WSUS hosts more than 80 international students every year from over 20 countries and students from 15 different states. Nearly 300 students at the Upper School become involved in the performing arts at Sem and 86% of students participate in at least one sport. 700 WSUS football players have played college football over the last 30 years. The Upper School field hockey team has seen 17 undefeated seasons and has won five PIAA state championship titles, including as recently as 2011 when they won the state title for the second consecutive year, the first back-to-back state championships in Sem field hockey history. The WSUS boys' basketball team won their division title four consecutive times, including as recently as 2010. The Men's tennis team has achieved great success winning 72 straight conference matches (current streak) and achieved state runner up status after falling in the 2012 PIAA State Championship; they were led by legendary coach Michael Balutanski. The Upper School wrestling team has won the Pennsylvania Prep State Tournament five years in a row. Wyoming Seminary's has an active and successful Mock Trial program. Under the coaching of history teacher Adam Carlisle, the team has received numerous distinctions in pre-season state invitationals, placing 4th, 2nd, 3rd, 4th, and 2nd in 2010, 2011, 2012, 2014, and 2015, respectively, at the University of Pittsburgh Annual High School Mock Trial Tournament, the largest invitational in the Commonwealth. Sem Mock Trial has won the University of Pennsylvania's Benjamin Franklin Invitational, considered the most competitive mock trial tournament in Pennsylvania,[by whom?] four consecutive times, from 2012–2015 and boasts six District Championships since 2008. In state competition, the team has placed 10th, 4th, 1st, and 7th in 2008, 2010, 2011, and 2013, respectively. In 2011, after winning the State Championship, Sem Mock Trial placed 6th in the National High School Mock Trial Championship in Phoenix, Arizona. Since 2010, the program has competed in the Empire New York: The World Championship tournament in New York City, placing 4th, 2nd, 17th, 13th, and 2nd. Since 2012, the team has also competed in Princeton University's Spring Moot Court Tournament, one of the largest and most prestigious moot court tournaments in the country. Their teams have placed 3rd (2012); 5th and 6th (2013); 5th, 6th, and 8th (2014); and 1st, 2nd, and 4th (2015). Attorneys Guerline L. Laurore, Daniel Hollander, and Leana Blazosek are the current attorney coaches. Latin teacher David Johnson is an assistant teacher coach. Since 1979, the Upper School's 19th century buildings have been listed on the National Register of Historic Places. Since 2006, portions of the Upper School campus have undergone a large-scale renovation, with the housing facilities of Swetland, Darte, and Fleck Halls renovated on the outside, the Kirby Library (on the second floor of the Stettler Center) renovated, a brand new third floor introduced in Sprague Hall, the construction of Klassner Field for field hockey and lacrosse games, the construction of the O. Charles Lull Tennis Center, and a brand new first floor of the Lower School. In 2013 the school completed the renovation of Nesbitt Memorial Stadium to include two turf fields supporting football, soccer, lacrosse, field hockey, baseball and softball, new locker rooms and field house, new grandstand and a press box. The Kirby Center for Creative Arts, supporting the school's music, theater and dance programs, was completed in the fall of 2014. Wyoming Seminary Upper School requires an art history and a music history course, offers multiple art and drawing courses, music courses, and chorale. Sem's campus has two art studios, a ceramics studio, and a darkroom on campus. Each trimester, the art students put their work up in The Great Hall for display and put their work up in the fall term in Nesbitt Hall for display. Every several months, photography students have a show in the Buckingham Performing Arts Center. Students are also allowed to work on arts projects during the summer at the Performing Arts Institute (PAI). Students interested in music, dance and musical theatre spend the 42-day session on campus, and are exposed to world-renowned artists. Every year, PAI hosts a theatrical production at the F.M. Kirby Center in downtown Wilkes-Barre, including Two Gentlemen of Verona in 2010 and Gypsy in 2009. Renowned actor Austin Pendleton joined the PAI cast for the production of Gypsy. The Upper School's Madrigal Singers, a 28-voice choral group, have gained recognition for their proficiency. The group has toured worldwide — touring Asia in 2006. In summer 2007 the group also toured in Germany through their host, The St. Lioba School in Bad Nauheim Germany. During the summer of 2009, the Madrigal Singers competed in an international choral competition in the Czech Republic. They entered 4 categories and won two gold and two silver medals. They continued this tour by singing in various locations throughout Slovakia and Hungary. In the summer of 2010, the group returned to Bad Nauheim to participate in the Festivokal singing festival. The group is under the direction of Sem performing and fine arts department chairman John M. Vaida, a member of the Sem faculty since the 1970s. Orchestra, jazz band, chorale, and smaller ensembles are available for all students to participate in every year. Sem is the host for the Wyoming Seminary Civic Orchestra, founded by Jerome Campbell and directed by Yoon Jae Lee until 2013, in which local students perform with local musicians. Pit-orchestra gives students the opportunity to work with local musicians as well. The Upper School drama department, run by 1991 Sem graduate Jason Sherry, also has many participants at the school. Sem hosts a musical in the fall, an acting workshop in the winter, and a play in the spring. Auditions are open to all students regardless of their experience and, at times, is open to faculty as well. Lisa Caputo served as Press Secretary for Hillary Clinton during her tenure as First Lady of the United States and as a Deputy Assistant to President Bill Clinton, serving both positions during President Clinton's first term from 1993 to 1997. She is the Chief Marketing Officer for Citigroup. Frank Carlucci served as the United States Secretary of Defense for President Ronald Reagan from 1987 to 1989 after serving numerous other cabinet posts in Republican administrations. Howard Gardner is an American developmental psychologist, widely recognized for his famed theory of multiple intelligences. Dan Harris is a Hollywood director (Imaginary Heroes) and a screenwriter (X2 and Superman Returns). Henry M. Hoyt was a Union general in the American Civil War and served as the 18th governor of Pennsylvania in the late 19th century. Mitchell Jenkins was a Republican U.S. Congressman from Pennsylvania's 11th congressional district from 1947–1949. Paul Kanjorski was a Democratic U.S. Congressman who represented Pennsylvania's 11th congressional district from 1985 to 2011. Fernando C. Kizer was a Republican Wisconsin State Assemblyman. W.S. Merwin is a prolific American writer who was the U.S. Poet Laureate from 2010 to 2012. Elwood Quesada served as a Lieutenant General in the United States Air Force after leading the tactical air support during the D-Day invasion of Normandy. He also served as the first head of the Federal Aviation Administration and was a one time owner of the Washington Senators. Don Sherwood was a Republican U.S. Congressman who represented Pennsylvania's 10th congressional district from 1999 to 2007. Joe Torsella was elected in 2016 as Treasurer of Pennsylvania, was the United States Representative for United Nations Management and Reform for President Barack Obama, was Governor Rendell's chairman of the Pennsylvania State Board of Education, and was the President and CEO of the National Constitution Center in Philadelphia from 1997–2003 and 2006–2008. John Yudichak, who did a PG year at Sem, was a Democratic State Representative who represented Pennsylvania's 119th Legislative District from 1999 to 2010 and is the State Senator for Pennsylvania's 14th State Senatorial district. Several alumni have played professional ice hockey, among them Dennis Packard (AHL/Europe), Arpad Mihaly (AHL/Europe), Zoltan Pal (Europe), Eric Tangradi (AHL/NHL), Lukas Friedl (Europe) and Aleš Pařez (Europe). Several alumni have played professional football, among them Ralph Chase (NFL), Quentin Harris (NFL), Richard Barlette (Arena), and Jonathan Churchill (Arena). Several alumni have coached in professional football, among them Chuck Bresnahan (NFL), and Harry Hiestand (NFL). Lauren Powley was a member of the United States women's national field hockey team from 2005–2008 and she competed in the 2008 Summer Olympic Games in Beijing, China as a member of the U.S. women's field hockey team. Sukanya Roy, winner of the 84th Scripps National Spelling Bee. ^ a b Zbiek, Paul J. Luzerne County: History of the People and Culture. Lancaster, Pennsylvania: Strategic Publications, 1994. 116-117. ^ Bailey, Chester P. "Night Football Game – 1892". Tri-Counties Genealogy & History. Archived from the original on 2007-01-10. Retrieved 2006-12-26. 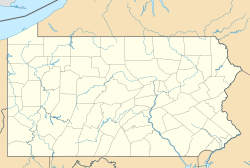 ^ "National Register of Historic Places — Pennsylvania — Luzerne County". National Register of Historic Places. Retrieved 2006-12-26. ^ "Wyoming Construction Project". Powered by The People magazine. 2010-05-11. ^ Barber, Ryan. "Two-week tour of Asia worth singing about" (PDF). Wilkes-Barre Times Leader. Retrieved 2006-12-26. ^ "KANJORSKI, Paul E., (1937 - )". Biographical Directory of the United States Congress. Retrieved December 21, 2012. ^ "Lieutenant General Elwood R. Quesada official USAF bio". United States Air Force. Retrieved 2009-04-28. ^ "Arthur J. Weaver". National Governors Association. Retrieved 24 September 2012. ^ News, A. B. C. (2011-06-03). "Sukanya Roy Wins 84th Scripps National Spelling Bee". ABC News. Retrieved 2017-06-03. ^ "Melkote wins spelling bee at Wyoming Seminary". Retrieved 2017-06-03. Wikimedia Commons has media related to Wyoming Seminary.